I love my blog. Unfortunately, I haven't had much time for it. Why you ask? Because Devin started walking! That's right! He's my earliest walker at 10 months of age. Now my only free time is during nap time and I am busy trying to accomplish everything I possibly can in those two hours. Here's a really poor quality video of Devin walking. Pay no attention to the lady in her jammies! Devin is constantly getting into things, climbing on things, and tasting things. Yesterday I had to call Poison Control. You know those little gel silicone packs that come with shoes or jackets that are labeled "Don't Eat?" Well, they are not poisonous. 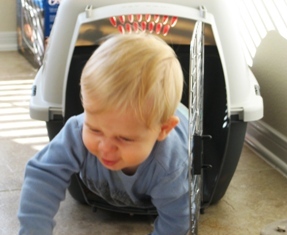 After that incident I found Devin in the dog carrier. I ran for the Camera. But by the time I got it, was crawling out. Would you like a $30 flash drive for free? I did it! Here's the link: Money Saving Mom. Nap time's almost over so I'm going to try to unload the dishwasher so that I don't have a baby crawling into it while I'm doing dishes. what did I just write???! He is a STINKING cutie! He is a sticking cutie! Look at him go! I love the posing! Oh. That's tough. The walking stage!!! My girls gave up naps this summer and it about killed me. At least you still have those for awhile??/?? For me and Diego, this was definitely the most exhausting stage. I feel for you. So, this completely explains why I haven't spoken to you for weeks! It's nice to know you're not avoiding me. Back in the days when I did daycare, we had a few babies that walked as early as nine & ten months. They always looked too tiny to be toddling around. They reminded me of little wind-up dolls! LOL! Thank you so much for commenting on my blog. I am so glad that Kira married someone that has such a amazing and supportive family. I hope that I can get to know you better and also meet you one day. About the walking! Ahhh I would die walking at 10 months. They just get into so much trouble when they start walking around. I am not looking forward to my little guy walking or crawling for that matter. I am very glad is only way of getting around right now is with me.